With Cayden James holding all of Star City hostage, things are more dire than ever. The conflict between Star City's two superhero teams comes to a head, as a disagreement between Oliver and Dinah regarding Vigilante's trustworthiness endangers one of their own. As good as a job as Paul Blackthorne does of selling Quentin's torment, his subplot of trying to convince Black Siren that there is a hero in her is idiotic even before the end of the episode ruins any chance the viewers might have of Black Siren achieving redemption. Why do Black Siren and Cayden James not kill Black Canary while she's helpless? James may want Oliver Queen to suffer but he has no reason to spare the other heroes of Star City. And since when has Black Siren ever shown restraint when given a chance to kill, much less a chance to take out her arch-rival? The only thing redeeming Quentin's subplot is Paul Blackthorne's excellent performance. Juliana Harkavy continues to slay as Dinah Drake. I know we're probably supposed to be sad that she's returning to violence but her declaration at the end that she's killing Black Siren had me cheering because of the strength of Harkavy's performance. The flashbacks in the script do a good job alternating between the scenes of Dinah and Victor undercover in the past and Vigilante working undercover in the present and maintaining the tension of both. Felicity suggests using a sniffer device -which pulls electronic data from any hard drive or devices close by - to track Cayden James. Cayden James' server has 80 terabytes of data on it. Felicity helps Vigilante to bluff past Cayden James by telling him to say that just because he knows how to handle a gun doesn't mean he can't tell the difference between a trans-polymer hybrid and a fiber-optic cable. He also asks how James maximized the data throughput. Vigilante: You believe me, right? About not knowing about the ARGUS divers? Dinah: I already told you I do. Vigilante: I guess what I'm asking is... do you trust me? Dinah: Does that answer your question? Cayden James: I don't like surprises. And I like even less the feeling that I can't trust my comrades. Vigilante: It sounds like it's just me you don't trust. Cayden James: You were always the enigma, Mr. Sobel. The vigilante willing to ally himself with criminals to take out other vigilantes. I must confess I never totally bought into it. Given your background as an undercover operative, I would have been a fool to. (pauses) I don't strike you as a fool, do I? Vigilante: No, but you are coming off a little crazy, though. Dinah: Don't you dare! You know damn well that if it was Felicity out there... (throws a side-glance to John) If it was Lyla, this wouldn't even be up for debate. Vince is my family! And I'm not letting him die. Not again. Dinah: You're not talking me out of this, Curtis. Rene: We know. That's why we're coming with you. Curtis: You're our family too. Curtis: We'll save Vince. (looks to Oliver) You save the city. Anatoly: Hello, Kapiushon. No need for me to explain choice here, yes? Green Arrow: I thought you were an honorable man?! Anatoly: I am. Why else I give you choice? Dinah: You shouldn't be here. Dinah: You lost that right when you decided to leave Vince on his own to die. Oliver: I'm truly sorry about what happened to Vince. Because I know what he meant to you. But this was his call. And he knew what he signed on for. Dinah: (scoffs) Wow. You are really bad at apologies. Oliver: I'm not hear to apologize. Dinah: Of course you're not. Oliver: I'm here to explain that... this wasn't all for nothing. Felicity's been going through the data that Vince pulled out and for the first time... Dinah, for the first time, we have some viable options. Dinah: Viable options? You know, I used to tell Vince his way of seeking justice wasn't viable. I convinced him to change. Just how you convinced me. But you know what, Oliver? Vince was right. The only way to bring justice to this city is with a bullet. Dinah: I'm going to make sure Vince didn't die for nothing. I am going to kill every last one of them. Starting with Laurel. Captain Hill is the new acting head of the Star City Police Department. Cayden James kills an entire ARGUS dive team that attempts to sneak into Star City amphibiously by setting their comms system to electrocute them. As the episode opens, Oliver has sent $70 to Cayden James. He guesses they have a day or tow before the money runs out. William is hidden in an ARGUS safehouse. Quentin catches Black Siren stalking him. Vincent Sobel and Dinah Drake were first partnered five years ago in Central City. Captain Singh - who is Barry Allen's superior on The Flash - was also their boss. 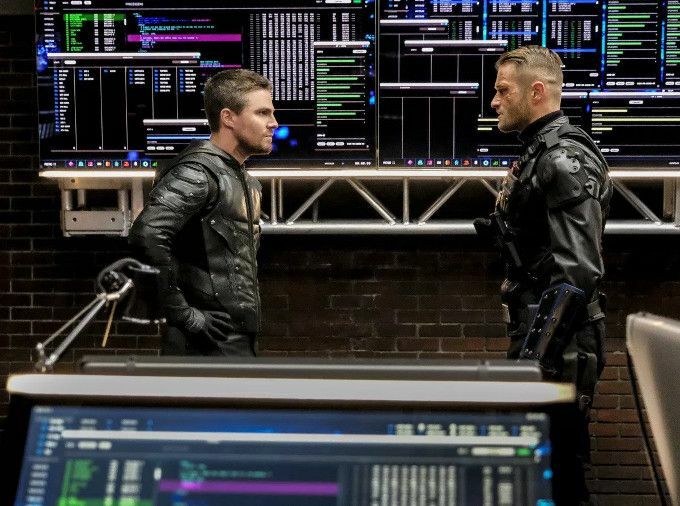 Cayden James' war council believe that some unknown factor was responsible for killing Sheck in 611 - an ARGUS agent, probably - since none of Team Arrow would use lethal force and the cops weren't capable of fighting back at the time. Oliver promises to take Felicity to Aruba for their honeymoon once Cayden James is caught. Aruba was also the preferred vacation destination of Mick "Heatwave" Rory in L301. Felicity refers to the sniffer device she used to get information from Prometheus' mother in 514. Quentin tells Thea about Black Siren stalking him. 06/14/1998 is the birthday of Owen Post - Cayden James' son. It's also the code to get into his server room. Alena makes her first physical appearance on the show in several episodes. Quentin confronts Black Siren with a video/photo slideshow of his Laurel She screams that that isn't her and destroys the equipment before fleeing. The flashback scenes with Vince and Dinah lead up to the footage from 511 showing how Dinah got her powers. Black Siren kills Vigilante with an extended point-blank sonic blast right through his ear. Rene says it took him days to react to anything after his wife was murdered. Alena finds the video that made Cayden James think The Green Arrow killed his son. It was digitally doctored using the same techniques used to make the faked photo of Oliver Queen as Green Arrow that was leaked to the press in 601. This means that whoever faked the photo is someone working with Cayden James who would know how he would react and that there is another traitor in his team. Thea tells Quentin that Black Siren killed Vigilante. The flashbacks to when Dinah and Vincent Sobel first teamed up take place in Central City. It's kind of disturbing how everyone refers to Black Siren as Laurel instead of Black Siren now. I'm sure this is a writing note to push Quentin's conflict but it just seems like most of the characters would be very strict about making it clear that this woman is Not Their Laurel given how much Laurel is supposed to mean to everyone. It's also disturbing how much Quentin is investing in trying to save Black Siren given the daughter he still has (though Sara is probably not that great about writing home) and is ignoring the foster daughter he has in Thea, who is supporting him despite her better judgement. Hopefully this will be setting up Quentin realizing the family he has vs. the family he's lost by season's end. Between heroes who can't put their personal drama aside for the sake of the greater good, villains who are three steps ahead of the heroes at all times and whatever victories the heroes win being Pyrrhic, this whole episode feels like a vintage Judd Winick comic. If it weren't for the Quentin subplot, this would be a harmless piece of filler typical of mid-season CW shows. Paul Blackthorne does a fantastic job of selling Quentin Lance's conflict but it seems like this subplot is only there to give him and Willa Holland something to do because the Black Siren redemption arc seemed stupid even before she killed a helpless hero who honestly was trying to find redemption. All I can say is Viva Black Canary and her efforts to kill Black Siren next week. I know we won't be so lucky as see that happen, but we can dream for another week, at least.